Famous for using his culinary skills to influence people around the world, celebrity chef Jamie Oliver gives his advice about running your own business. 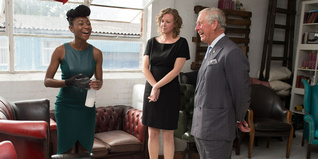 HRH The Prince of Wales visited a furniture designer’s workshop in Bermondsey, London, to meet design entrepreneurs supported by The Trust's Enterprise programme. The new centre will allow The Trust to focus its activity and provide a better quality of support for disadvantaged young people across Pennine Lancashire. New research from The Prince's Trust and HSBC indicates that business leaders are facing skills gaps, threatening to hamper economic growth. 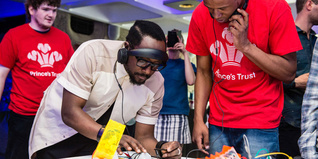 will.i.am has supported hundreds of unemployed young people through STEM-focused Prince's Trust programmes. Jerry Hall speaks about the importance of equipping the young generation with the skills and confidence to succeed, so that they can achieve their dreams. 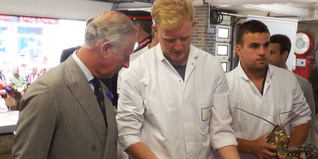 HRH The Prince of Wales visited Looe fish market, where he met young people who have changed their lives with help from The Trust. 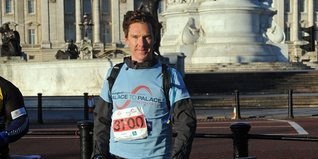 Generous fans honour Benedict Cumberbatch's birthday by fundraising for The Prince's Trust. The UK Fire and Rescue Service has won a Big Society award for its ground-breaking work with young people.